The words "Customer Satisfaction" are being used so much today that they are almost cliche', however, at Ray's RV it meant the way to build a business from the ground up. One customer at a time. Not by selling them a product, but by servicing the product that they already purchased elsewhere. Ray figured if he could fix a guys problems that somebody else wouldn't or couldn't, he would earn the trust of his new customer and make a friend. As it turned out, he gained so many new friends that he had to expand his service facility because for miles around it seemed that the guys doin' the sellin' weren't doin' any fixin'! Not long after, his customers started asking his advice on what new RV to buy. They figured that he'd know a good one cause he'd repaired so many. Then they started to say, "Ray, if you sold RV's, I'd sure buy my next one from you!" Fortunately, for thousands of Ray's new friends, he started selling the best built RV's he could find, stocked up his parts and accessories store, added service bays and rounded up the family to fulfill his dream. Not a whole lot has changed though. The big sign still says Ray's RV Service and before he greets you, most times he pulls a shop rag from his pocket to wipe off the grease before shaking your hand. This is the beginning of true Customer Satisfaction. 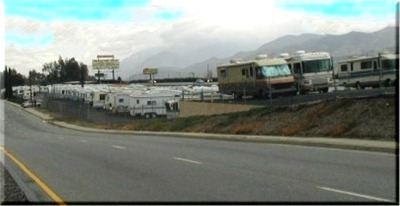 If you are an RV'er and find yourself on the 10 freeway, going to or coming from the desert, it's worth a quick stop to meet the Boyd family. You never know when that need for some service, a part or just great advice might pop up. When it does, you'll know just who to call.